Materials Research Society of Serbia - YUCOMAT 2018 – New abstract submission deadline June 20! 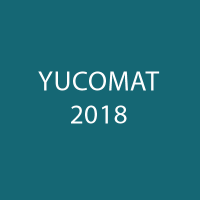 YUCOMAT 2018 – New abstract submission deadline June 20! 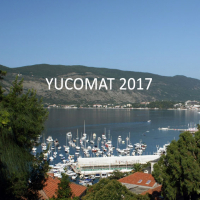 Considering the continuing abstract submission and few more available time-slots for oral presentations, the deadline for the abstract submission is prolonged till June 20th, so you can still send your contributions for the Twentieth Materials Research Society of Serbia Annual Conference YUCOMAT 2018 that will be held in a charming little town at the Adriatic coast, Herceg Novi, Montenegro, 3-7th September, 2018 (http://www.mrs-serbia.org.rs/index.php/first-announcement-and-call-for-abstracts). 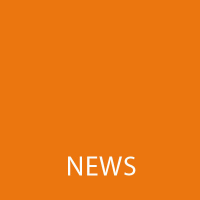 Conference is organized by Materials Research Society of Serbia, endorsed by Materials Research Society (MRS), European Materials Research Society (E-MRS) and Federation of European Materials Societies (FEMS). Program of the Conference consists of five one-day Symposia dedicated to advanced methods in materials synthesis and processing, advanced materials for high-technology application, nanostructured materials, eco-materials and eco-technologies and biomaterials (http://www.mrs-serbia.org.rs/index.php/symposia). The objective of the Conference is to critically consider the most actual problems in materials science and engineering. We are please to announce that YUCOMAT 2018 will host two Satellite Symposiums, "Hybrid Interface Materials" and “Advanced Materials for Biomedical Engineering” with the participation of professors and students from Korea and Taiwan. 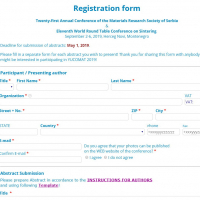 On-line registration and abstract submission (http://www.mrs-serbia.org.rs/index.php/registration) is open. The system automatically confirms the submission (scroll to the top of the page after you click on Submit button). The Abstract Submission Deadline is June 20th, 2018. We already have an impressive list of confirmed plenary speakers (http://www.mrs-serbia.org.rs/index.php/confirmed-plenary-speakers ). Since we expect a large number of participants, we would like to most cordially urge you to register and submit an abstract on-line as soon as you can. Please look at the information about conference fees and hotel room reservations and prices. The information about the conference fees is available on the conference website (http://www.mrs-serbia.org.rs/index.php/general-info/conference-fees ). Please note that the number of hotel beds at Hunguest Hotel Sun Resort (conference venue, http://www.mrs-serbia.org.rs/index.php/general-info/accomodation ) reserved for the conference participants is limited at 150, and their availability is based on “first-in, first-served”. 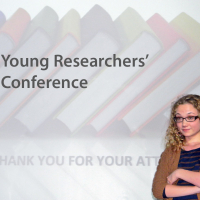 We will publish new and update existing information as they come, so please keep visiting Conference website. 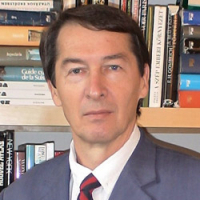 We are please to announce that the recipient of the MRS-Serbia’s 2018 Award for a Lasting and Outstanding Contribution to Materials Science and Engineering (http://www.mrs-serbia.org.rs/index.php/award/2018-mrs-serbia-award-for-a-lasting-and-outstanding-contribution-to-materials-science-and-engineering ) is Prof. Dr László Forró of the Ecole Polytechnique Fédérale de Lausanne, Laboratory of Physics of Complex Matter, for his achievements in the engineering of new materials, including inorganic and organic materials, as well as biomaterials. Prof. Dr Forró will give invited plenary lecture during the Opening Ceremony of YUCOMAT 2018. 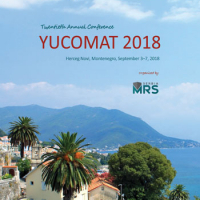 We are looking forward to seeing you at YUCOMAT 2018.